Teams collaborate to design and build a giant city with interconnecting zones out of everyday materials. Participants are motivated and inspired by successfully working towards a common goal. Together, they develop a common vision and a shared strategy while applying creativity and excellent project management skills. We need a large space in a private conference room with a round table for each team and a chair for each participant. We will also need 2-3 long tables at the front of the room for event materials. If the group is larger than 50 people we will need a microphone and speaker setup. As with all TeamBonding events, we are happy to customize this interactive team building activity for work by incorporating your company message into the introduction and debrief. Teams are given a zone of a model city to build. The city has zones such as industrial, residential, leisure and business districts, as well as interconnecting infrastructure features like roads, rails and waterways. They then must collaborate to develop a plan for the city, ensuring there is uniformity of design across the zones and that roads and rivers flow coherently with the other teams’ sections and the city as a whole. Using a wide range of materials, they build an imaginative and creative urban landscape that is both functional and aesthetically pleasing. When the time is up, teams join the sections of the city together and celebrate their shared success. Planning and strategy through effective cross-team communication and collaboration are essential to ensure the zones of the city interconnect and flow. Resource and time management are also necessary in order to complete the project on time. 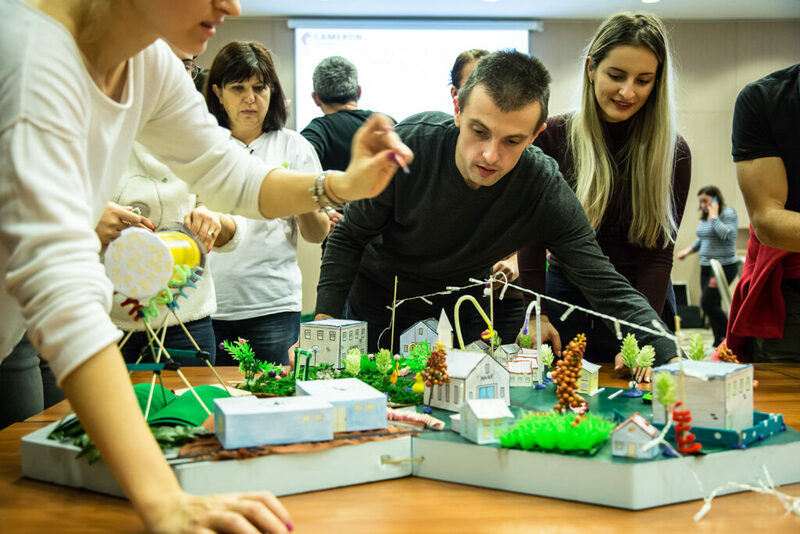 City Build is a fun, memorable, shared experience that relies on engagement from all individuals, good team dynamics and collaboration across the whole group to ensure success.